One of the strength of Flickr image sharing and photo management service is that users are entitled to upload unlimited and as many photos to Flickr as users like, although free account users are subjected to a monthly limit of 100 MB of total image sizes, while paid Flickr Pro subscriber account does not have such restriction. To make Flickr better, Flickr also support uploading video for online storage and sharing. Both free and paid premium Flickr users can upload videos, although free users are only allowed to upload 2 videos of up to 90 seconds in length. Pro users has no restriction, and can even upload high definition (HD) quality video. With video support and increasingly higher resolution of photos, the file size and amount of images and videos to upload keeps increasing, and this makes uploading via Flickr web-based upload page and Flickr web-based basic uploader much less reliable and inconvenient. To make the uploading job easier, Flickr has also provided desktop software that simplifies the job to upload photos and videos to Flickr, in addition to many Flickr upload tools. Flickr Desktop Uploadr desktop uploader runs on user’s desktop for heftier uploading needs or offline photo management. Drag and drop single photos or videos, or select a whole folder. 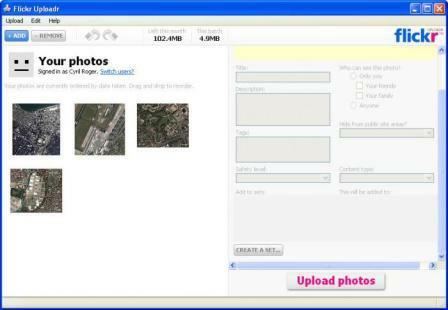 User can even reorder how photos will be displayed in the photostream. Flickr Desktop Uploadr supports Windows 7, Windows Vista, Windows XP and Mac OS X 10.5 or 10.4, in 8 languages, and is now been updated to version 3.2.1 as of June 11, 2009.